We love cute kittens! Bringing them home is so exciting and quickly making them comfortable in their new home is the key to a happy, long-lasting relationship. Before you pick up your new kitty, you need to invest in fun toys, high quality, kitten-friendly food and, most importantly, a super-comfy kitten bed so that their first night with you is as cosy as possible. Keeping a new kitten warm is instinctive - you just want to wrap them up in bed with you. But they'll soon grow to love their new bed and it's better for both of you in the long run if they gain some independence early on. For ultimate warmth, invest in a kitten bed with plush faux fur lining. 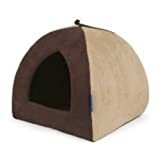 Most beds are open but you can find luxury kitten 'caves' that they can crawl into to feel extra safe. 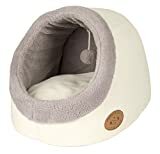 There are also plush sleeping bags for kittens, offering a safe opening at the top and a cosy pocket into which they'll happily slip night after night. You'll soon have a regular snoozer on your hands! Okay kittens are teeny weeny first of all, but some cats grow at an alarming rate. If you don't want to have to buy another bed in a few months' time, opt for the largest kitten bed you can find. 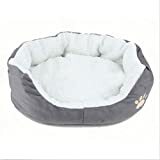 It's a good idea to get a bed that's designed specifically for kittens as conventional cat beds can be a little overwhelming for them. But among the kitten beds on the market, there are various sizes to choose from. Most beds for kittens will be fairly compact and lie on the floor. These styles are handy for portability - you may need to let your kitten sleep in your bedroom to assure them that you are there. Pop them next to you on the floor and they'll sense that you're close all night. Donut shapes tend to be pretty popular amongst baby cats as they feel totally enveloped by the warmth of their new bed. 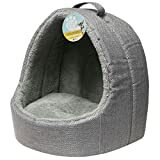 There are other styles to choose from, including beds that have a frame you can pop over the radiator so that your kitten can snuggle up to a source of warmth for a really good nap. Kitten beds are great for bringing comfort to your new pet wherever you go. They will quickly get attached to it so if you need to take them anywhere, travelling with their familiar bed nearby will help to keep them calm. If you get your new kitten home and they take an immediate dislike to the bed, don't panic! First of all, try moving it around the house: under tables, in corners, next to beds. A new location might be all it takes to get your kitten to try the bed out. It also might be that the new smell of the bed is putting your kitten off. It might help to leave an item of your clothing in there (wear it for a day first) for a few hours. The smell of you will help to reassure them.